KANDOPLEU/ABIDJAN, CÃ´te dâ€™Ivoire, Aug 26 (IPS) - The nurse carefully packs the body into a plastic bag and then leaves the isolation tent, rinsing his feet in a bucket of water that contains bleach. Then he carefully takes off his safety glasses, gloves and mask and burns them in a jerry can. Behind a cordon, hundreds of people are watching, including Ivorian Health Minister Raymonde Goudou Coffie and several local media. They face no risks even if the deadly virus kills up to 90 percent of the infected persons: there is no Ebola outbreak in Côte d'Ivoire. And the corpse is a mannequin. This is an Ebola simulation. "We want to test our medical teams. And see what we can do to improve our reaction," explains the health minister, a pharmacist by training who does not hesitate to provide her in-sights. Schoolteacher Edinie Veh Gale is in the crowd watching the exercise. "It is not translated in Yacuba, the local language. So people around do not understand. But it is good though. At least, it piqued people's curiosity and they will search for information," she tells IPS in French. While the attention on the epidemic that has now been declared "out-of-control" is focused on the West African countries of Sierra Leone, Liberia, Guinea and Nigeria, unaffected countries in the region, like Côte d'Ivoire, are struggling to understand what to do keep the disease away. 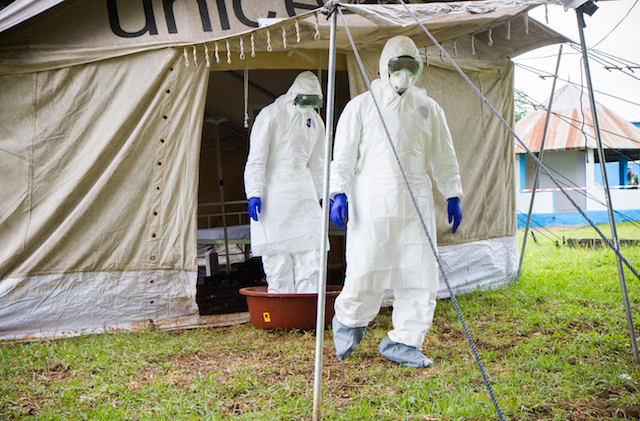 While strict epidemiological-control measures have been applied, including closing borders and banning people travelling into Côte d'Ivoire from countries where the disease is prevalent, the current outbreak has highlighted huge gaps in prevention methods. Especially since some citizens refuse to submit to restrictive measures. Until now, the previous Ebola outbreaks were contained in villages in Central Africa where distance and isolation were important factors in stopping the disease. But the current wave that resulted in over 1,135 deaths — making it the worst Ebola outbreak ever — has spread to several urban centres. In the cities restrictive measures have been met with reduced success. Susan Shepler, an associate professor at American University and a specialist in education and conflict, is back from six weeks of research in Sierra Leone and Liberia. Despite several measures adopted by authorities, she noticed that while there have been some developments in the population's awareness, most people in those countries have a deep mistrust for government assistance. "It is not simply a mistrust of the state. It is a mistrust of the system. People don't see the boundaries of the state," Shepler tells IPS. She explains that citizens believe politicians enter government to enrich themselves, and they therefore do not think that the state could help them. She says that trust has yet to be built as many people, especially those who reside in opposition strongholds, see Ebola as a government plot or a religious curse. In Sierra Leone, Liberia and Guinea, government services and trained medical workers are barely available in regions infected by Ebola. So when heavily-equipped medical teams, often backed by foreign experts, go to affected areas, it has been difficult for those local communities to instantly trust them. "Western media tends to present the crisis with a focus on frontline work and chaotic scenes. But what is missing, understood, is everyday life. There is a rationale for citizens' actions," says Shepler. It is difficult to discern what are good practices to fight Ebola. Côte d'Ivoire may not have any cases, but it is uncertain if this is because the country took the right approach to the disease or if it was simply a matter of luck. But what is clear is that Côte d'Ivoire fears being the next site of the outbreak. Around the country, the government has multiplied preventative measures. Last March, it banned bush meat. And since then the government has adopted several measures to contain the epidemic, including implementing screening for the disease at borders and banning direct flights to affected areas. Now, the government has recommended that people stop hugging and shaking hands, insisting that they comply with strict hygiene rules. The government has made also several efforts to build the trust of its people by getting local authorities and medical staff that are know to local communities involved in education campaigns. And citizen's initiatives are also multiplying. In a bank in Abidjan's commercial district, a security guard gives a shot of hand sanitiser to any client using the banking machine. "It's for your own health," he says. In front of the same bank, street hawkers who help drivers park their cars refuse to shake hands. Social media has exploded with various initiatives, notably the #MousserpourEbola (#FoamingAgainstEbola) challenge, which is used to raise money and public awareness about Amyotrophic lateral sclerosis (ALS), otherwise known as Lou Gehrig's disease. Launched by a young blogger, Edith Brou, videos of Ivorians throwing a bucket of soap water on themselves have became viral. When one is nominated for the challenge, you are required to throw a bucket of soap water on yourself and distribute three bottles of hand sanitiser. They you don't agree to the soap shower, then you have to distribute nine bottles of hand sanitiser. "Ivorians play down everything through humour. In spite of the funny aspect of it, the message is forwarded and listened to. There are many actions like mine. We cannot only stand by. We are responsible for our lives," she tells IPS. In the village of Pekanhouebli, in the west of the country and close the the Liberian border, there is no electricity and no internet access. But in this village that strongly supports the opposition, a citizen's committee has been created to mobilise the community against Ebola. "We did not believe that Ebola was true. We thought it was a white man's disease from cities when authorities came to us,"senior resident Serge Tian tells IPS. "But when we heard it on the radio, we realised it was true. And we started listening to the nurse who would visit the village." Tian does not shake hands with IPS as we leave — it's because he now understands a bit more about how the disease is spread. And he knows why he should comply to these restrictive measures.